The J. B. Speed School of Engineering on campus. 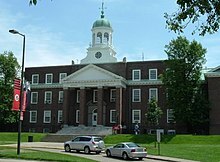 The University of Louisville is a public university in Louisville, Kentucky. The university has about 19,743 students. It was founded in 1798. The current president of the university is James R. Ramsey. The sports teams of the university are called the Cardinals. They have 21 varsity teams that compete in the Atlantic Coast Conference.